The Manhattan, simply put, is my very favorite cocktail. It’s my go-to cocktail for home happy hours or when I don’t know what I’m in the mood for. I always drink it in my special glass—the one with the bullseye on it. My wife gave me this glass as a gift and it’s my traditional happy hour cocktail glass. It’s important to establish little happy hour traditions at home. It’s also the drink that I typically order on the road to see if the bartender is capable of making a good cocktail or not. So while this drink is not new, my recipe collection would be incomplete without it. Fill a mixing glass halfway with ice. Add the bourbon or whiskey, vermouth and bitters. Gently stir for 20-30 seconds and strain into a chilled martini glass. Garnish with a maraschino or brandied cherry. 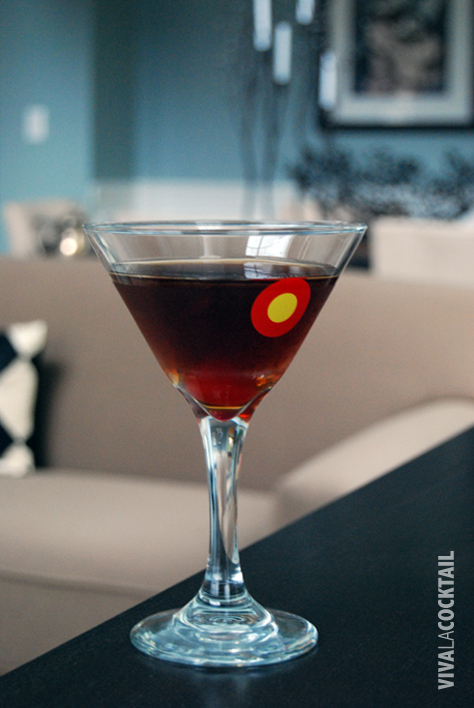 If you are new to drinking Manhattans, I suggest you start with bourbon since it is a little more approachable. Make sure you use a decent one such as Maker’s Mark. After you’ve grown accustomed to the bourbon Manhattan, move on to an American rye whiskey such as Sazerac Rye. 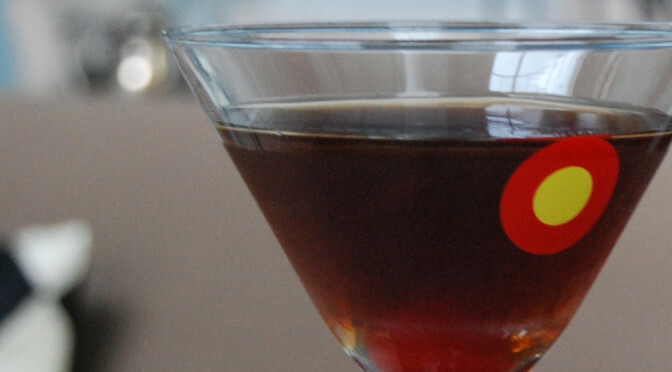 The original Manhattans were made with rye whiskey, so it is only fitting that you try one that way. Or you can just use Bulleit Bourbon which is a nice compromise between the two since it is a bourbon with a high rye content (about 30%). Cheers!